- Main Zippered Center Compartment (7"W X 15"LX 10"H) with: two each internal End Pockets with Velcro Flaps and two each long Padded Side Pockets perfect for storing handguns. - Heavy Duty Metal Zipper Tabs have Grommets for a small pad-lock (not included) to lock the compartment and help secure your gear. - Main cover has Velcro patch for Patches and Name Tape and a Top Velcro Loop for Securing Hearing Protection for easy access when at the shooting range. - Front padded compartment can help keep your magazines organized. Internal Elastic Loops can hold up to 8 each AR15 magazines or up to 16 each double stack Pistol magazines and a separate internal Padded Pocket. Loop Velcro patch sewn onto the front face of the compartment for Patches and Name Tape. 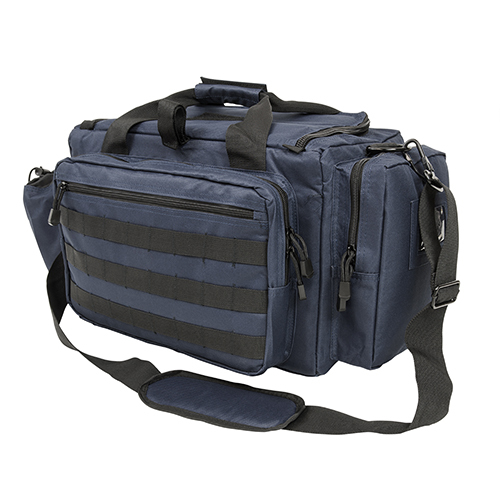 - Rear Padded Compartment can hold more of your gear and magazines. More Internal Elastic Loops for up to 4 each AR15 or 8 each double stack Pistol magazines. Front zippered Pockets for storing paperwork, pen, markers, and score sheets. - Side Padded Compartment with ID Card Window for storing your shot timer, eye protection, and other gear. Internal Elastic Loops for up to 2 more AR15 magazines or up to 4 each double stack Pistol magazines. - Side Beverage Pocket with an adjustable bungee and Velcro strap. - Includes a Brass Bag with an Adjustable Top Draw String, a Metal Clasp Hook, and with a Mesh Bottom Netting to sift the dirt from your brass. - Large Metal D-Rings on the ends of the Competition Range Bag. - Wide Padded Shoulder Strap with Metal Clasp Hook.